Cremation urns are the final resting places for many loved ones, and unlike caskets, these urns are frequently displayed in places of prominence for generations to come. This is not only a way of remembering a loved one, but also a way of extending to them a very special honor and place in our lives. Because of their intended uses and legacy intent, a variety of cremation urns are available in all manner of materials, with countless adornments and artwork. 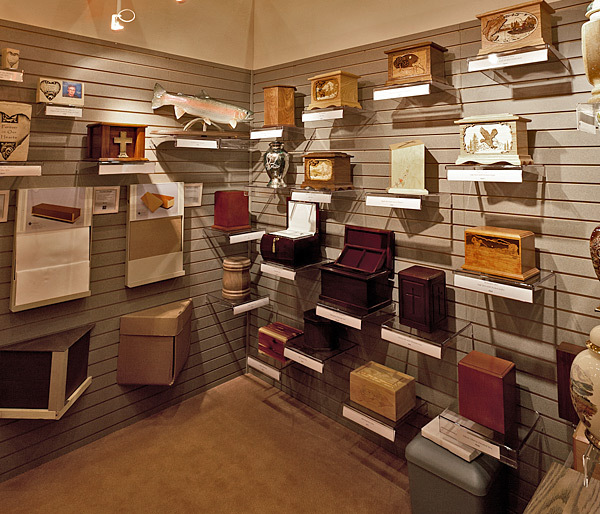 At the Anderson Stevenson Wilke Funeral Home & Crematory showroom, we maintain a large selection of cremation urns for you to view and choose from. Because of the vast options, we cannot keep them all on-hand, but we are happy to show you catalogs and place orders for you. We will ensure that your selection will arrive in a manner that suits your schedule. Shown in the photograph above are: a Cast Bronze Aristocrat Polished Urn; a Minuet Cloisonné urn; a Hardwood Urn made from Fredericksburg Cherry adorned with a Praying Hands Ornament; Forest Green Keepsake urn.